The ordinary minister for the Sacrament of Marriage is not a Priest or a Deacon, as is usually thought, but the couple themselves. Marriage is an intimate sharing of life and love. There are four words to describe marriage. Sacrament – You do not receive the sacrament of matrimony. It is something you become. You are sacrament in the presence of God’s life and love to each other. Covenant – marriage is a special kind of relationship. Your relationship with each other is permanent and faithful, in good times and in bad times. Commitment – You freely choose to take each other not just on your wedding day, but every day of your life together. Vocation – God has called you and your spouse at this time of your lives to a mutual self-giving. Through this unselfish love, the world can see the love Christ has for His people enfleshed in your love for each other. The rite begins with a Priest or Deacon addressing the couple to be married. In this address, Marriage is described as a Sacrament of enrichment and strengthening and the duties of Marriage are to be assumed in mutual and lasting fidelity. The self-gift of one to the other is then pledged in the declaration of consent by the Bride and the Groom, and is given expression in the exchange of rings, in the name of the Trinity. The exchange of vows can take place either within a Mass or within a ceremony. Planning your wedding day can seem like a daunting experience, involving a large number of people and a seemingly endless array of details. Often, in the midst of making plans for the wedding reception, the wedding liturgy itself can begin to feel like “just one more thing” to do. In truth, your wedding ceremony is the central part of your big day. It is a sacred celebration meant to express your faith in God and your love for each other. It is, in fact, what makes you married – legally, publically and in the eyes of the Church. Marriage is a sacrament that takes time for preparation. We want couples to be well-prepared. Saint Patrick Catholic Church offers marriage preparation to help couples develop a better understanding of the sacrament; to evaluate and deepen their readiness to live married life; and to gain insights into themselves as individuals and as a couple. Couples who are contemplating marriage at Saint Patrick Catholic Church should contact the Parish Center to meet with the Pastoral Assistant for Marriage Preparation six to nine months before your anticipated wedding date to begin sacramental preparation for marriage. It is our hope that as you learn about our faith community you will be inspired to offer us your prayers and maybe some of your time, talent and treasure as time allows. We are excited for you and hope you consider our sacred space for your upcoming wedding. We are here to help you all we can! 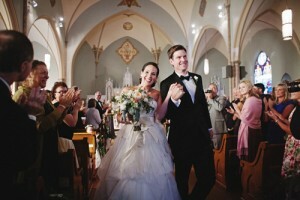 Weddings are celebrated on Saturdays at 11:00 a.m. and 3:00 p.m. and on Friday evenings. The exchange of vows can take place within a Mass or within a ceremony.